If you are anything like me, I've warded off Blue Cheese entirely over the past five years, having learned somewhere along my gluten-free journey that it, in its many forms, is not gluten-free. It's tough to order some of the delicious and safe salads served in certain dependable restaurants and always have to ask for the blue cheese to be removed or better yet, replaced with Feta cheese (which I love too much). This question of whether all blue cheeses are gluten-free or not has perplexed me for some time, and I've told myself on 50 different occasions that I would invest in some thorough research and get to the bottom of this mystery once and for all...assuming the research was even available? So when I was eating lunch at a favorite local Country Garden Restaurant two weeks ago, one of my favorite waitresses, who is always so aware and concerned about serving me safe and delicious lunches, came to me with a copy of and article in the Celiac Disease Foundation (CDF) Newsletter Fall 2009 issue titled, "Blue Cheese in the Gluten Free Diet;" it must have been meant to be. The article was written by Alex Anca, MHSc.,RD of Canada (writing for the Canadian Celiac Association), and given the important information that's included and the scientific and technical information included, I would be remiss in trying to summarize - so click here to read the article in its entirety. 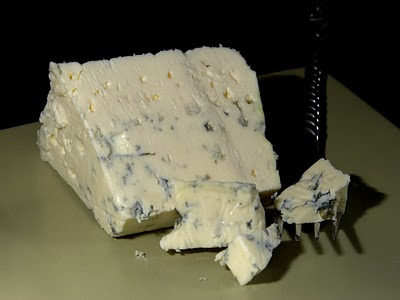 Very good information with the bottom line being this - based on the most sensitive tests available, it seems that blue cheese IS safe for consumption in the gluten-free diet! This will make my next visit to France even more enjoyable. Now, if we could only work on those darn, delicious baguettes! It's just not fair. Well, it's the last day of winter and tomorrow we get to welcome spring; what a relief! There's renewed hope and feelings of joy that come from feeling the sun on your skin and enjoying the longer days. It also happens to be Guest Blogger Friday, once again, so with spring starting tomorrow and the hope of what new adventures might lie ahead, all these thoughts have let me to conjure up of visions of travel and exploring new places...as well as new restaurants in distant lands. For all these reasons, I invited my virtual friend and founder of Gluten Free Travel Site, Karen Broussard, to tell us all about her wonderful site and what's new in the gluten-free travel world. Thanks Karen, and please visit her site. Everyone is also encouraged and invited to post their travel and restaurant reviews for both domestic and international favorite hot-spots. Whether you’re a newly diagnosed Celiac – or have been following a gluten-free diet for years – one of the biggest challenges has always been finding places to get a safe meal outside of your home. 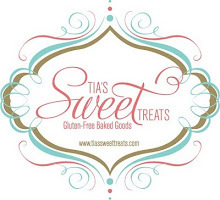 Well, I’m happy to say that I believe the gluten-free community has finally reached the point where we have a number of great choices for safe and delicious gluten-free fare in almost any area around the country, as well as in popular domestic and international travel destinations. When I launched GlutenFreeTravelSite two years ago, things were really starting to take off, in terms of increased availability of gluten-free foods in stores and increased awareness at restaurants. No matter what your view of chain restaurants (love ‘em, hate ‘em, or have learned to love ‘em! ), there are now dozens that offer printed gluten-free menus upon request. We have definitely “come a long way, baby!” How wonderful it is to be able to find at least a few restaurants, in virtually any metropolitan area, that understand and respect your special diet. Search our own list of dozens of national and regional restaurant chains with gluten-free menus. I guarantee you’ll spot a restaurant chain you may not have heard of! When you click on any restaurant on our list, you’re taken to a “landing page” for that restaurant, with links to their gluten-free menu, locations, and sometimes even coupons they offer. It’s great to check this list before any trip you take…I view travel as a great opportunity to try “gluten-free friendly” chains that we don’t have in our own area. We’ve “discovered” some of our favorite restaurant chains with gluten-free menus, like Biaggi’s, while traveling! And of course, for those who prefer finding “hidden gems,” those independent neighborhood restaurants that bend over backwards to serve safe and wonderful gluten-free meals. I’m pleased to report that their numbers are increasing as well. When I read the restaurant reviews that get submitted to our website each day, it makes me want to travel with my family to try many of these great-sounding places first-hand! No doubt, restaurants are responding to market forces: U.S. News and World Report recently reported that up to 15-25% of consumers are looking for gluten-free options due to Celiac Disease, or for other health reasons. So these restaurants are smart…gluten-free options translate into a HUGE growth market…and in this economy, there aren’t many similar “growth” opportunities! At GlutenFreeTravelSite, our goal is to give people on gluten-free diets a true “vacation from worry” when dining out and traveling. Our database of 800+ gluten-free dining reviews (of restaurants, hotels/resorts, cruise ships, and grocery stores) can give you ideas and feedback, whether you’re looking to try someplace new in your area or traveling halfway around the world. 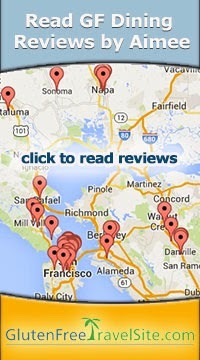 Search our Reviews and learn more. We’ve also recently added enhanced search capabilities within our database to allow visitors to the site to narrow their search of our gluten-free dining and travel reviews down to the town/city or zip code level – and then map the results. We welcome YOUR reviews, as well. It’s one of the best ways you can help other Celiacs…and thank those establishments that have gone out of their way to accommodate people on gluten-free diets. It’s nice to be able to “spread the word” and help give them some free publicity in this difficult economic environment. When you submit a review, you’ll be automatically entered into our monthly contest where we choose one particularly helpful review from the prior month’s submissions and showcase it on our Featured Review page. The winning reviewer gets a FREE set of Triumph Dining restaurant cards (for American, Italian, Mexican, and Chinese cuisine). This All-Clad Stainless Steel saute/simmer pan was my Christmas present, as previously mentioned on this blog. But for me, this gift was just waiting for the right moment or recipe to be put to use. For almost two months it sat in my cupboard, all wrapped up and shiny - almost a bit intimidating, to be honest. 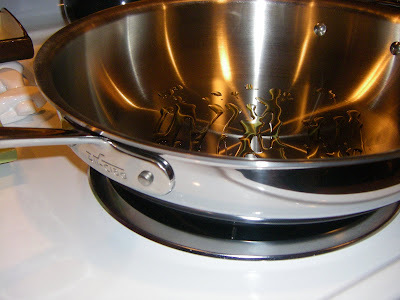 But alas, during my sick week at home (last week) when I was making soups and chopping up lots of fresh food I decided that it was time to baptise the All-Clad in fire and put this saute pan to use! With that said, I didn't really have a particular recipe in mind but intuitively speaking, I saw a dish that was centered around chicken and yummy flavors. So, as I rummaged through my fridge the idea came to me - a Mediterranean-type chicken saute with olives...I think the Greek Gods were somehow inspiring this one. It dawned on me, while throwing this recipe together that cooking really healthy, quality, good food for yourself or your family every day doesn't have to be complicated or super expensive, especially if you are budgeting a house full of Celiacs or gluten-free eaters. Real food, spices and herbs come loaded with all you need for flavor and nutrients - God sure planned this out well. And the more pure and less complicated the ingredients, the healthier and more flavorful the dish. With spring around the corner I could get inspired. First, let halved chicken breasts sit out in a bowl on your counter for 15 minutes, while marinating with olive oil, and fresh lemon and rosemary. (The chicken breasts don't work if they are too cold). Begin by sauteing in pan with olive oil, chopped onion, minced garlic until all are tender and light gold in color. Then slowly add broth, wine, and chicken halves. Let cook on med-high for about 15 minutes while stirring occasionally. 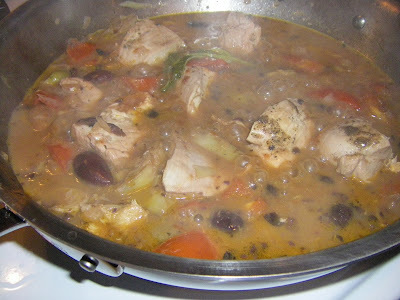 Then reduce heat to med-simmer and add tomatoes, artichoke hearts, olives, and remainder of liquid from artichoke halves. Add garlic salt and salt and pepper to taste...let all simmer for 20 + minutes, or until the chicken breasts are cooked through and tender. Finish by squeezing your halved lemon all around the dish. Serve with toasted, gluten-free bread and a nice glass of wine and Voila...dinner is served. If you have a favorite recipe that you love to cook in your All-Clad or any clad for that matter, please share them with all of us. 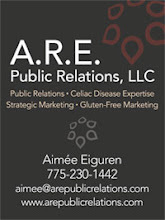 Stay posted - next week we have a special guest blogger from the Gluten-free world! I am a soup person - I love soups of all kinds but a lot of the time eating soup in a restaurant, that's not home made, is quite impossible due to the abundant use of wheat flour in most soups as a thickener. Rarely is there a time when I find a safe soup that I can completely trust to be gluten-free. I know it's the same for most of you, as well. This past weekend I was fighting off a crummy cold (again) and decided after a bountiful shopping spree at Whole Foods that I would hunker down and cook...soup. One of my new, most favorite cook books I've been working out of is Cristina's of Sun Valley, by Cristina Ceccatelli Cook. A Tuscan native who moved to Sun Valley, Idaho years ago, is not only the author of this book but the founder and owner of Cristina's Restaurant, which she opened in 1993. It's such a delightful restaurant tucked away in my most-favorite location in downtown Ketchum, ID at 520 Second St. East. The food put forth at Cristina's is always uncomplicated, original and delicious...rooted in her native Tuscan taste buds and classic flavors. Whether you drop by (make sure to call for a reservation) for a delicious, hearty breakfast or brunch, a visit to the colorful and tempting deli case to pack up for a picnic, or dining by candlelight in the cozy dining room, you are sure to leave Christina's sated and armed with one of her cookbooks! So back to soup...I have to admit that I've never cooked a Tomato Bisque from scratch. It's one of my favorite soups though, so when I found Cristina's tomato bisque recipe that was so simple and fresh I couldn't resist. My mom assisted and we whipped up a huge pot of warmth and a very healthy and warm meal that I've been enjoying for several days. It was a small accomplishment that put a big smile on my face upon the first taste while thinking to myself, "hey, I just cooked this delicious soup." It is such an easy recipe that I don't think Cristina will mind me sharing it with you all, and most importantly...it's gluten-free! Simply saute the onion, garlic and basil in olive oil until onions are tender and light gold in color (until they become transparent). Then add wine and let cook for a few minutes. Add tomatoes, red pepper flakes, salt and pepper. Simmer for about 12 minutes, stirring occasionally. Then pulse mixture briefly in a food processor or blender to obtain a creamy consistency. (I had to pulse the mixture in two different batches, for the same amount of time and it worked perfectly). Return (all batches) to the original pot, whisk in the cream and bring to a gentle simmer. When ready to serve, drizzle each bowl of soup with olive oil and garnish with a fresh basil leaf and home made gluten-free croutons. Croutons: Thanks to a gluten-free friend, I learned of the delicious Udi's Gluten-free food/bread that I've been toasting all week. 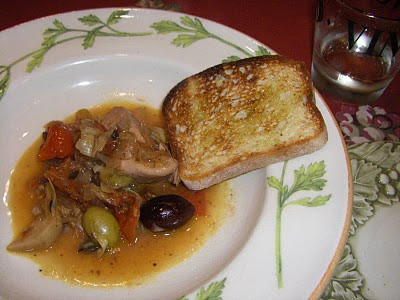 I just toasted the bread, drizzled with olive oil and then cut into squares and garnish the soup. I also grated fresh parmigiano that topped it off perfectly. Stay warm. Eat gluten-free soup. Say thanks to Cristina!